This is a project of The material of city making research theme, part of the Infrastructural Geographies thematic research group. By 2050, three-quarters of the world’s population will be living in cities, and a quarter in conditions of extreme poverty in the slums and informal settlements of cities of the developing world. The signs of rebalancing this situation are not promising, as elites, middle classes and powerful local and international interests organise to make redevelop the city in their image. As a consequence, the urban poor are being pushed out, neglected, and essentially left to their own means of survival. This project examines the contemporary mainstream framing of urban poverty, and the counter-narratives of inclusion and empowerment. 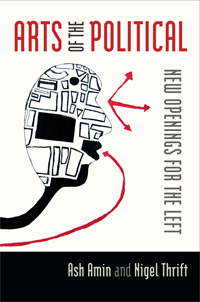 This work is both conceptual and empirical, with the former focusing on contrasting arts of the politics of inclusion, and the latter focusing on attempts by the poor themselves to build housing and infrastructure (in the city of Belo Horizonte in Brazil, with further work planned in Kenya and India). Amin.A. and N. Thrift (2013) Arts of the Political: New Openings for the Left, Duke University Press, Durham, NC, in press.